(With a very special thanks to Yukari Toshimichi and the Solid & ETC Fan Art Team whom have officially granted myself, UV, Ultra Violet Studios & Ultra Vox Productions International exclusive written permission to use their Hellsing Fan Art Illustrations in official UV Digital Art Works! 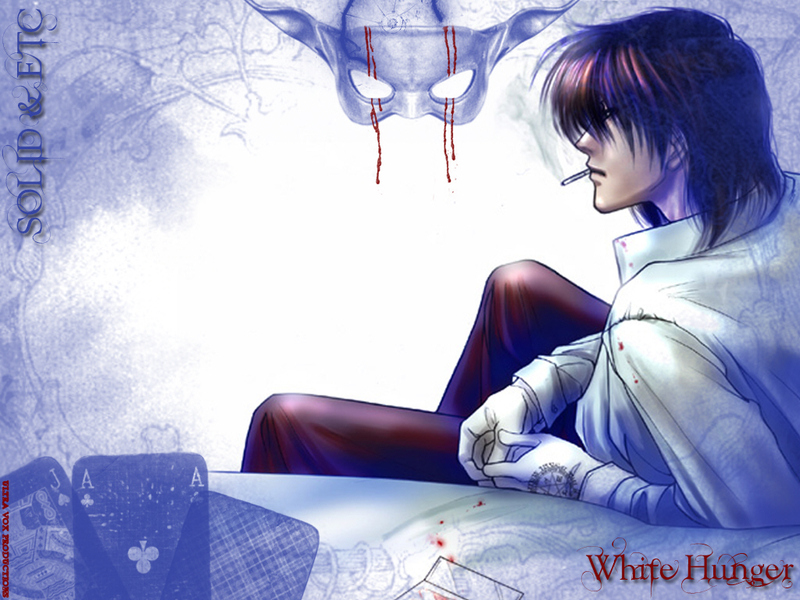 White Hunger began as an experimental work and finished as a rather charming, simple piece featuring a simply beautiful illustration of Hellsing's Alucard. Primary focal elements included serenity and subtle violence. Hellsing fans will immediately recognise the blood transfusion package resting on the bed and likewise the droplets of blood that stain collar and sleeve of this incredible vampire's shirt as he rests after quelling his insatiable hunger. This work's composition included minor CG SFX and multi layered brush work. *whistles* That really does the art justice. It's nice to see an Alucard wallpaper with a colour other than red. Whoa that's a cool pic of alucard. i think it's da first time i see him without evil grin on his face. this is a very elegant wp. it brings out Alucard's tamer side very nicely. I'd love to use this on my computer, if you don't mind. thank you for sharing this. very cool and Stylish! Solid & ETC Forever! I like it very much! Alucard - My Favourite Character! and the white color used for the wallie is really nice. Alucard looks so hot! He's also relaxed and... he smokes? He's just like a normal man, he doesn't look like a vampire at all. Great wallpaper! Es genial, Alucard me encanta con el cabello corto y tiene un aire de realeza que no se lo quita nadie... simplemente maravilloso... Excelente trabajo.